Insects are small animal arthropods that have six legs (hexapod invertebrates) and generally one or two pairs of wings. There are an estimated 10 million different insect species. However, the lay press equates insects with almost any small bug or animal that bites or stings. Consequently, insect bites may be attributed to not only small arthropods but to other small invertebrate animals that can either bite, sting or cause a chemical reaction (for example, blisters or pain) in human skin. Although some individuals would exclude stinging from biting insects, most medical and/or nonmedical individuals include stinging animals when discussing insect bites. If you can safely capture the insect or bug that likely bit or stung you, this may help your doctor to design the best treatment, if any, for you. However, if you develop any problems like tissue swelling or shortness of breath, go immediately to the emergency department. Although many insect bites, stings and released chemicals result in reddish itchy skin, some have signs and symptoms that may help identify the cause. The following are: mosquito bites; reddish raised itchy, lesions, Fire ant stings produces blisters that are small and have pus in the center of the blister, bee stings with painful welt with possible mark in the center where the bee stung, wasp stings similar to bee sting, Flea bites with small red bumps that itch, mainly on the legs and ankles, chigger bites with small red lesions usually in warm areas like the waist, elbow and knee folds, tick bites after or during the initial bite - the initial bite site may be reddish, brown recluse spider bites begins as reddish skin that can develop into a skin ulcer, black widow spider bites; begin as two red puncture marks and can ulcerate, reduviid bug bites get contaminated with bug’s feces; reddish-brown skin rash, puss caterpillar (skin reaction to released chemical skin irritant); 2-4 rows of painful, reddish, small lesions that mimic the shape of the caterpillar, and blister beetle (skin reaction to released chemical skin irritant when bug is crushed); painful skin blisters, some lesions. Although most insect bites signs and symptoms usually only last a few days, many insects are vectors that may carry viruses, bacteria and parasites that can harm humans or even kill them. Mosquitos can be vectors of several diseases that include malaria, yellow fever, West Nile, Dengue, elephantiasis and Zika virus. 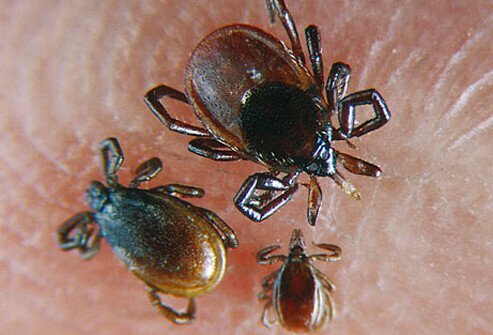 Depending on the type of tick, Lyme disease (signs and symptoms of reddish target lesions or Rocky Mountain spotted fever (symptoms include small reddish rash) can be transmitted to humans. Reduviid bug bites can transmit the parasites that cause Chagas disease with symptoms that include fever, eyelid swelling, headache and splenomegaly. Stings from such insects as bees, wasps and other flying insects that bite can cause allergic reactions that can be life-threatening such as swelling of the tongue or throat that can stop breathing if not treated emergently. Some skin lesions produced by insect bites may become infected. Brown recluse spider bites can result in local tissue destruction and crater-like scarring while the black widow spider bites can cause severe muscle cramping and central nervous system excitation due to the neurotropic toxin released in the bite.